Actually, as I recall, the ‘Sunday Times’ backed a Leave vote, while ‘The Times’ was for Remain; an inversion of the position of the Mail titles where the ‘Daily Mail’ (under its previous editor) was a strong advocate of Leave while the ‘Mail On Sunday’ supported Remain. I like that. That is, as a description of a thing I don’t like it’s very apt and concise. And yes, one of the clearest indications that the modern Establishment is not your grandfather’s Establishment is the replacement of the Times by the Guardian as the low-circulation newspaper which nobody reads except the People Who Matter (according to them). “2019? This could be the year when May is finished before April starts”. Sir Humphrey doesn’t read the Guardian, Sir Humphrey tells the Guardian what to write. I can’t back this up with facts, because it’s a “a friend of mine said that his friend heard on the radio” type of story, but apparently there is a Convention that when the government can’t make a decision, and parliament can’t reach a majority, then the decision goes back to the people. I’ve not been able to find any info online on this, so it could just be nonsense. Didn’t the government make a decision to leave the EU some time ago? Isn’t this a case that the government made a decision by parliamentary vote and are refusing to carry it out? Surely a case for Crown intervention ((c) 1975 Australia)? My worry is that the legal challenge on the “meaningful vote” means that they’ve reached a kind of legal deadlock, and therefore (if what my friend says isn’t complete tosh), then there might be a legal requirement for a people’s vote. I *think* it will just mean that we exit on 12th April with No Deal, but it was enough to concern me. I think it is worth pointing out that in this scenario the Queen would be acting on the advice of the Prime Minister and not on her own initiative. Throughout her reign Brenda has been impeccably observant of the rule that monarchs do not get involved in politics. The words are probably engraved on her heart. She’s not going to change now. BTW, I suspect the Queen is quite capable of using “choice” language when the occasion demands. News from the HM Stationary Office! Just in case of an unplanned exit from Brexit, a new poster is being printed. ‘… but apparently there is a Convention that when the government can’t make a decision, and parliament can’t reach a majority, then the decision goes back to the people. Yes I have. It’s called a General Election. There are precedents for a Queen sacking a prime minister on the advice of her cabinet. (There are of course, precedents for a Queen just sacking a prime minister, but older ones.) 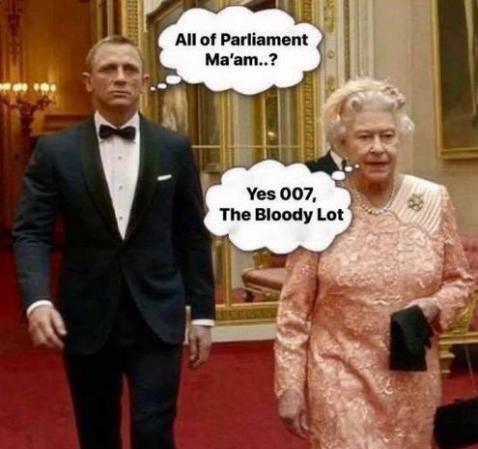 Both Mrs May and Parliament would seem to be getting themselves into a very false position – which is an amusing way to say it, since perhaps in one sense Mrs May’s own position is becoming increasingly clear. The nearest precedent I can think of is Ramsay MacDonald – who, by a similar contrivance of switching party with a few fellow turncoats, managed to remain our pacifist Prime Minister during the first three years of Hitler’s rule, to the latter’s very great advantage. One hopes this latest attempt will fail like the rest, but it is informative. There are some pro British independence people in Parliament Niall – although, alas, I can think of any pro British independence people in the House of Commons who represent Scottish Constituencies (hopefully I am mistaken on that matter). However, it is true that many (not all – but many) people in the House of Commons are dreadful. Only last night I watched and listened to them LAUGH and mock basic truths, and generally act like utter vermin. It was depressing, profoundly depressing. It can never be stressed too much that the “Remainers” in the House of Commons are NOT honest people who happen to take another view – but take that view in good faith. On the contrary, these “Remainers” in the House of Commons (including the Prime Minister and the Chancellor – who pretend they are not “Remainers”, but are) are totally dishonest people – they are not people of good faith, they are people of bad faith. They hate truth – and they in deal in lies, they deal in lies every day. They are despicable people whom one should SHUN. And these people must NOT be Conservative candidates for Parliament. I have not come to this conclusion quickly – as to accuse other human beings of being people of BAD FAITH is a very serious matter. I have come to this conclusion after long observation and consideration of the words and deeds of these people – over a period of years. Niall – there is no “great cockup”. This has been deliberate sabotage of the prospect of independence of this country, by Mrs May and the rest of the establishment – sabotage from the start. If I have typed falsely – may I be struck dead, right now. This very second.